There is that certain moment that you've been looking forward to, when the lights go down, the action starts, and you realize a movie will live up to your high expectations. This is what happened with PACIFIC RIM, the newest movie by director Guillermo del Toro. To set up the story, it's Earth in the "not-so-distant" future where for about ten years, the world has been fighting the kaijus, a gigantic species of alien monsters that came out of a huge portal at the bottom of the ocean. To fight them, humans created Jaegers, which are huge robots that are controlled by two pilots, each for each side of the brain and sharing their nervous system. We pick up the story of Raleigh Beckett five years after his last encounter with a kaiju in his Jaeger, Gypsy Danger. Kaijus are now stronger, bigger, and they're coming out of the portal with more frequency and have now destroyed all but four Jaegers. The world's governments plan to shut down the Jaeger program in order to to focus on building walls around the coast lines, but when a kaiju breaks throw the wall in Sydney very easily, we have Stacker Pentecost (Elba) recruiting Raleigh for One Last Mission. To start off with the more negative aspects of the movie, there are some weaknesses to the script in both its plot and some of the dialogue. Charlie Hunman, who plays Beckett, has the most egregiously terrible lines in the film. Not being familiar with Hunman, it is difficult to tell whether he is not the most charming of lead actor or the fault truly lies with the script. Coupled with some of the dialogue were some strange plot points that were brought up, actually instigate one of the biggest fights in the movie, and then subsequently dropped without explanation. It definitely fees like one del Toro's weaker scripts that he's worked on. Everything else about the movie? Downright amazing. Being the resident robot nerd meant that any scene with a Jaeger was an exciting one for me. On such a technical level, you appreciate the sheer scope of the Jaegers. There are many scenes shown with them being repaired or the pilots being loaded into the heads. These sequences never get old. The movie does a wonderful job of never letting you forget that these are huge machines with nuts, bolts and wires, along with obvious fancy technology that allows them to link up neurologically. On the flip side, the kaijus are equally huge! Any time that they are about to attack a city, they tower over buildings and seem to really make you appreciate just how big these monsters are. What seems to have been something that del Toro and his designers took into account is the fact that all of the Jaegers, and to a lesser extent the kaijus, all have of their own unique designs and makes each of the fights instantly engaging because you can tell what's going on in the fights and who is who. It's a shame that we actually didn't get to see more nationally-aligned Jaegers. Rumor has it that there was going to be a Mexican one that was in an earlier draft, way to represent us del Toro! Going along with those lines, the world building of the movie is something that adds so much to the experience. If you take the time to notice it, you see just how much everything has changed. The most interesting indications are the characters Dr. Newton Geizsler (Charlie Day) and Hannibal Chau (Ron Perlman). The good doctor's obsession with the kaijus factors in to the movie's plot, but just as interesting is his place as the "kaiju groupie" and even has certain kaijus tattooed on his arms with him representing Whereas Chau is a black market kaiju part dealer, where a seemingly huge economy has propped up thanks to the monsters. Culturally speaking, you see how adaptable the humans in this world are where they are still able to have lives despite the the threat of constant attacks always looming. The fight scenes which are the big thing being advertised are a visual treat. As mentioned before, since the Jaegers all have very specific and defining characteristics, you get to see and follow the action so much better than say....a TRANSFORMERS movie. On a more cultural level, we have a cast of characters and a story that's so varied race-wise that's refreshing to see in a world where William Fitchner will play an Americanized Shredder in the Ninja Turtles movie. 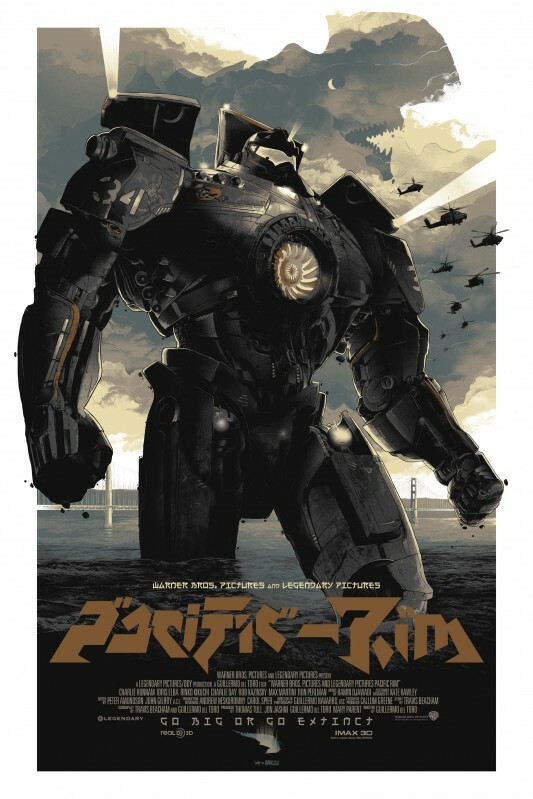 PACIFIC RIM will be seen as del Toro's most technically accomplished work. There are some rather glaring screenwriting issues with the movie, but on a certain level, this might be a classic staple in a lot of kids' favorite childhood movies. Personally, it felt like a huge thrill ride and its the definition of what I want out of a summer blockbuster. I enjoyed the movie for the first hour. I was really excited to see it but I felt the fight sequences were see one see them all. I loved the Jaegars they were super cool but felt like they could have accomplished the same thing with helicopters shooting missiles. The kaijus on the other hand were AWESOME. So many shout outs to the great Godzilla and bad b movies. The winged one immediately called to mind Mothra. And the tentacles one was sorta like Sharktopus. You can tell that Del Toro loves those movie. Charlie Hunnan of Sons of Anarchy fame was alright. He's much better in SAO. Charlie Day can do no wrong and his English counterpart was Dr. Owen from Torchwood. Which made me very happy. Overall I would say it was good but didn't quite meet my expectations. Nice review Javi. I was able to believe that monsters and robots could fight all of the time, and I never got bored of it. Awesome Review..In this movie action and the graphics looks AMAZING...And also i like robot movies...!!! I am great fan of robot movies since Transformers was one of the movie...In this pacific rim movie they are very action packed films which always caught my attention.